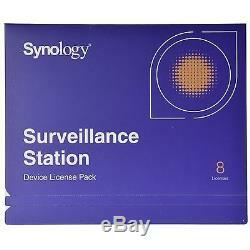 Synology IP Camera 8-License Pack Kit for Surveillance Station - All-Bays NAS. 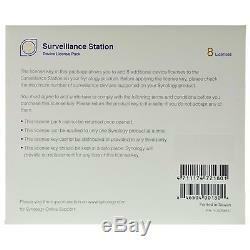 FOR SURVEILLANCE STATION VERSION 6.0 OR ABOVE. Synology Camera License Packs allow you to install additional camera licenses on your Synology Surveillance Station. One camera license is pre-installed by default on each Synology DiskStation. 1 license key with a single code to add 8 additional camera licenses to the Synology Surveillance Station service on your Synology NAS. THIS LICENSE KEY IS ONLY COMPATIBLE WITH SURVEILLANCE STATIONS VERSION 6.0 OR ABOVE. IF YOUR STATION IS BELOW VERSION 6.0, PLEASE UPDATE YOUR STATION BY FOLLOWING THE STEPS AS BELOW. 1 Go to your Synology Box, and login to the main desktop. 3 Under "Settings", locate the "Update" tab. 4 Available updates will be displayed. 5 You will receive a message once the update is completed and has been installed successfully. Your station is now ready for use at the latest version. Please refer to the Synology's Product Comparison page for the MAXIMUM NUMBER of IP cameras supported by your DiskStation model. COMPATIBILITY: CS-406, CS-406e, CS407, CS407e, DS-106, DS-106e, DS-106j, DS1010+, DS107, DS107+, DS107e, DS108j, DS109, DS109+, DS109j, DS110+, DS110j, DS111, DS112, DS112+, DS112j, DS1511+, DS1512+, DS1812+, DS1513+, DS207, DS207+, DS209, DS209+, DS209+II, DS209j, DS210+, DS210j, DS211, DS211+, DS211j, DS212, DS212+, DS212j, DS213, DS213+, DS213air, DS213j, DS2411+, DS2413+, DS3611xs, DS3612X, DS3612xs, DS408, DS409, DS409+, DS409slim, DS410, DS410j, DS411+, DS411+II, DS411j, DS411slim, DS412+, DS413, DS413j, DS508, DS509+, DS710+, DS712+, DS713+, RS10613, RS-406, RS212, RS2211+, RS2211RP+, RS2212+, RS2212RP+, RS222RP, RS3411xs, RS3412RPxs, RS3412X, RS3412xs, RS3413X, RS342XR, RS407, RS408, RS408-RP, RS409, RS409+, RS409RP+, RS411, RS810+, RS810RP+, RS812, RS812+, RS812RP+. Compatibility may extend to latest models. See Synology's website for more details. We will provide you with a link to track your package online. Boxes are amply sized and your items are well-protected. We carry a large selection of up-to-date mobile accessories in many brands and models, and at competitive prices. Ioomobile has been providing top-of-the-line items and services since 2007, simplifying the search for products that suit your needs. Look no further than our inventory! Currencies All products offered by ioomobile are in USD. The item "Synology IP Camera 8-License Pack Kit for Surveillance Station All-Bays NAS" is in sale since Thursday, November 13, 2014. This item is in the category "Computers/Tablets & Networking\Software\Servers, Development & DBMS". The seller is "ioomobile" and is located in Hong Kong.